The MTS EU committee held yesterday productive discussions about upcoming projects and priorities regarding the EU Institutions. 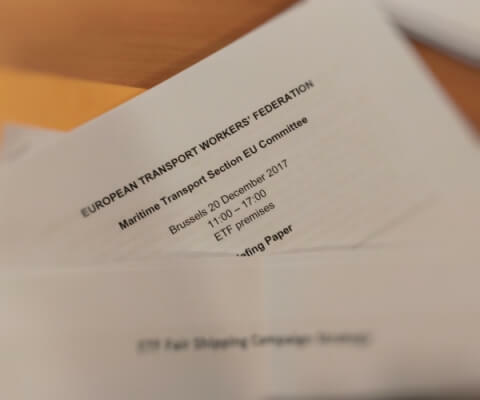 Representatives of affiliate unions agreed that fair shipping in EU waters should be a key policy aim over the coming months. Shipping is often a weak link in the supply chains that bring goods to Europe. We need to see EU employment standards for all seafarers serving onboard vessels regularly trading in EU waters. Affiliates pledged their support for this goal, and will be involved through political campaigning activities, research, surveying, and communication. The Committee also prepared today’s social dialogue meeting with the European Shipowners (ECSA): the EU-level representative of employers in the maritime sector. This meeting was a successful dialogue, with agreement that there needs to be coherent EU policies on visas for seafarers, full implementation of rules on stowaways and a revision of the directive on onboard medical assistance. The ETF also presented its report on violence against women in the transport sector.